It has been a SWELTERING week at the XOXO headquarters in NYC, and this heat wave doesn’t show any sign of stopping. It’s the type of weather that leaves only two appealing options for weekend activities: hunkering down in a café where the AC is blasting or hitting up a beach. Either way, having a great summer read on hand is a MUST. 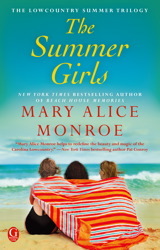 This weekend I’m excited to dive into Mary Alice Monroe’s latest bestseller, THE SUMMER GIRLS. It’s the first book in a new trilogy about the strained relationships among three half-sisters and the sassy grandma who helps reunite them. Throw in a guest appearance from a friendly dolphin, a little romance and a lot of family drama, and you have the makings of a perfect beach read. What are you tossing into your beach bag (or “café bag” if you’re opting for a cool blast of AC rather than a salty sea breeze) as you head off into the weekend? What’s your #FridayRead?